It’s been a rough week in the entertainment world, the deaths of David Bowie and Alan Rickman filling news channels, while in the last few days we also heard of the passing of veteran TV screenwriter/producer, Robert Banks Stewart. Born here in Edinburgh in 1931, Banks Stewart’s lengthy career included work in newspapers and magazines before he moved in screenwriting for series such as Danger Man, Lovejoy and Doctor Who – there’s an obituary over on The Guardian that goes into more detail. Although I own many of Banks Stewart’s work on DVD, it was a series of his that isn’t currently available to buy that I contacted him about back in 2010, the 1979 STV production of Charles Endell, Esquire. I was working with STV at the time on a project to bring various archive series back to life via YouTube. They were in the process of uploading shows such as Take the High Road, Dramarama and some top-notch Hogmanay specials, and I got in touch to offer my services as a freelance…well, freelance archive TV fan, if such a thing exists. During our first chat I mentioned a series I’d read about in dusty corners of the internet, a spin-off from 1970s ITV drama Budgie, which starred Adam Faith as small-time crook Ronald ‘Budgie’ Bird, and Iain Cuthbertson as dodgy Soho businessman, Charlie Endell. Seven years after Budgie‘s last episode, Charles Endell, Esquire arrived on STV screens, a comedy-drama that took Endell out of Soho and sent him back to Glasgow to try and rebuild his empire that had fallen while he was in jail. Robert Banks Stewart was a key part in its creation, setting the tone for the scripts. As part of my role at STV I was building up some additional material for the website, a kind of DVD extra for when Endell arrived on YouTube. I contacted Banks Stewart for an interview and he was happy to discuss his time working on the show. I also spoke to series star, Tony Osoba, and filmed an interview with director David Andrews about the series. Sadly, six years on, STV has seen fit to remove all traces of Charles Endell, Esquire (and almost all of the shows they uploaded) from YouTube and their website, so the Banks Stewart interview was gone when I went to find it earlier today. Thankfully, some traces of it remain on the internet if you know where to look, and I’ve retrieved the following for anyone interested in the development of a six episode Scottish TV series that few seem to remember. I still have hopes Endell appears on DVD one day as I think it’s a terrific piece of TV that deserves a place on our shelves. STV has repeated the show on its STV Glasgow channel in recent years, but it needs a wider audience. You can read more on the show on this blog, over on Cathode Ray Tube and on Lady Don’t Fall Backwards. In the meantime, here’s that interview with Bob Banks Stewart – I feel privileged to have spoken to him and can heartily recommend checking out his recently published autobiography if you want to know more about his life and work. Although the idea of kicking off Doctor Who’s ninth season with the ratings-grabbing return of the Daleks must have seemed like a good idea in 1971, the fact that the metal foes barely appear in Day of the Daleks thankfully doesn’t stop the story, now out on DVD, from being one of the Third Doctor’s most memorable outings. Called in to investigate sightings of ghosts at the home of diplomat, Sir Reginald Styles (Wilfrid Carter), just ahead of a world peace conference, the Doctor (Jon Pertwee) and Jo (Katy Manning) become involved in a plot to change the course of history thanks to guerillas from another time. As if that wasn’t enough to cope with, the Daleks turn out to be part of the 22nd century plot, with the Doctor forced to move back and forth between modern-day Earth and the future as the safety of the universe hangs in the balance. Running to just four episodes, writer Louis Marks manages to set up the story and involve viewers in the action with little delay, ensuring that time travelling soldiers of fortune, Ogron bodyguards and a dystopian future are introduced without anybody really missing the Daleks, who finally pop up at the close of episode one. Jon Pertwee glides through the story with ease, clearly relishing the opportunity to be a man of action, while the regular UNIT cast don’t hamper things too much. Aubrey Woods’ Controller is a decent match for the Doctor, though the assorted guerillas don’t make too much of an impact. Let down by the Daleks themselves, who neither sound as scary as they should or mark themselves out as being worthy of ruling the universe, the adventure does benefit from frequent pauses to contemplate the merits (or lack-of) of time travel and the consequences it can bring. The episodes also look good, in both time periods, the odd duff effect forgivable when everything else works so well. Tom Baker’s Fourth Doctor finds himself in a rather taxing situation in The Sun Makers, landing on Pluto in the far future with Leela (Louise Jameson) in tow as he discovers the planet’s populace is being kept in its place by The Collector (Henry Woolf). Assisting the rebels fighting to overthrow their oppressors, the Doctor discovers the true nature of The Collector’s origins and that sometimes money is the root of all evil. Written by Robert Holmes, perhaps Doctor Who’s most celebrated scriptwriter and also its script editor at the time of The Sun Makers, the story is packed with the type of humour rarely seen in the series. With overt references to the British tax system, this was never going to be your typical Saturday tea time romp, but social commentary doesn’t overwhelm the science fiction at the script’s core. Baker and Jameson are both on fine form and it’s a joy to see them take on Woolf and Richard Leech as Gatherer Hade, even if things do get slightly heightened as the story goes on. The guest cast are uniformly excellent, particularly Michael Keating and William Simons as Goudry and Mandrel respectively. Clever, challenging and always entertaining, The Sun Makers is a welcome DVD release which shows once again just how diverse the series has been over the years. Extras on this single disc edition include an informative commentary from Baker, Jameson, Keating and director, Pennant Robert, and a new documentary, Running from the Tax Man, which looks back at the story’s development and production. Yet more fact-filled production notes can be switched on to aid enjoyment while the usual PDF documents and a photo gallery are available. This week’s entry into The Culp Collection, my irregular trawl through the various Robert Culp TV movies which have appeared on YouTube over the last year or two, is Last of the Good Guys, a 1978 effort from Columbia Picture Productions. The 1970s saw Culp star in a raft of made-for-television films, with the genre a popular one for US TV networks keen to give their audiences 90 minute movies that they didn’t have to leave their homes to watch. Actors such as Culp, who was still appearing in the odd theatrical release, were still big draws for TV viewers, and he became a regular in films such as 1973’s A Cold Night’s Death and Last of the Good Guys. 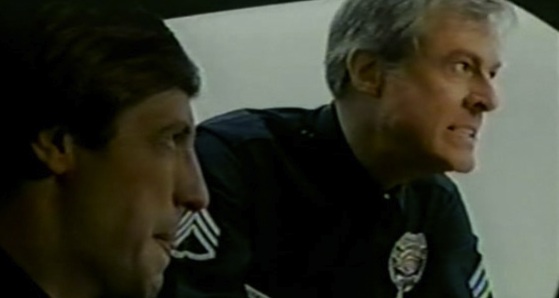 This time around Culp is cast as the establishment figure of Sergeant Nichols, a no-nonsense cop running an LA precinct of oddballs which includes Dennis Dugan’s Officer Johnny Lucas and Larry Hagman (who’s given Special Guest Star billing) as Sergeant Frank O’Malley. When we meet him, O’Malley is close to retirement, which immediately sets alarm bells ringing in the minds of experienced/jaded TV viewers. We soon discover that O’Malley has been ill for a while, but doesn’t dare tell anyone in case his pension is affected. As this film aired in the same year as the first season of Dallas, in which Hagman became a household name around the globe as JR Ewing, I’m assuming the two were filmed around the same time, but this is a very different Hagman to the oil tycoon. Hagman ensures O’Malley is a sympathetic character and it’s easy for the audience to feel for him. It’s tricky to explain the plot without giving away what could be considered a spoiler, but what happens next is the crux of the film; look away now if you’d rather not find out. Still here? OK, well O’Malley dies, leaving his wife and children to fend for themselves, until Lucas decides that he’s going to help his old buddy by pretending he’s alive right up until his retirement date, by which point he’s guaranteed a pay-out. Knowing that Nichols won’t agree to the scam, Lucas convinces his colleagues to set up an elaborate set of tricks and ruses which essentially mean O’Malley doesn’t attend morning roll calls while Nichols slowly begins to twig that his men are up to something. Following the death of Robert Culp in 2010, I made it my mission to try and watch more of his performances in films and on TV. It’s taken a while but I’ve finally got around to it, mainly thanks to YouTube and the appearance of a number of Culp TV Movies on the video channel. To kick things off I started with A Cold Night’s Death (also known as The Chill Factor), directed by Jerrold Freedman and first shown on ABC Television on 13 January, 1973. Culp stars as Robert Jones, a research scientist sent to a snowy research base along with colleague Frank Enari (Eli Wallach) when contact is lost with a Doctor Vogel. Snow storms have prevented previous attempts to reach the Doctor, and as we hear in a voiceover at the start, radio transmissions from Vogel had suggested that he’d been in discussions with Napoleon and Alexander the Great. Flying in by helicopter, Jones and Enari soon discover the frozen body of Vogel sitting at the radio transmitter, with no obvious signs of anything suspicious. The pair bring with them a monkey for research purposes, a companion for the other primates being tested for the US space race. From here the story begins to enter psychological thriller territory, with the two scientists trying to understand what happened to their predecessor while undertaking their own work. Needless to say, a type of cabin fever descends on the men, leading them to question each other about strange goings on during the night. Meanwhile, the monkeys quietly watch and listen. It’s a simple tale that’s given a sheen of quality due to the performances of Culp and Wallach, while Freedman, a veteran of TV Movies, manages to find some interesting angles in the confined set. While YouTube is hardly the best place to watch a film, 10 minute installments not the best viewing experience, it’s better than nothing and A Cold Night’s Death is well worth 90 minutes of your time. Well done to the team at Stephen J Cannell Productions for keeping the legacy of one of television’s greatest assets alive after his death: they’ve just launched a new website which remembers him and celebrates his career. Regular readers will know that my love of Cannell’s output, whether that’s The Greatest American Hero, The Rockford Files or The Rousters, knows no limits – those are a few of my Cannell DVDs above. A look around the new website reveals that they’ve ported a lot of content from the previous version but also added some new items. As well as information on the majority of his shows you can download Cannell’s scripts from each of them for free. Combine those with the online writing tutorials, both written and in video, and there’s a writing course just waiting to be taken. I’m hoping that they keep adding new information from the Cannell vaults over the coming year, certainly some clips from the rarer shows that didn’t quite make it as big as The A-Team. Interviews with Cannell production staff would also be good to see. For my own part in publishing more Cannell content, I managed to interview long-term Cannell friend and collaborator, Mr Jo Swerling, Jr, while on a recent trip to Hollywood. Jo produced many of Cannell’s series and had a lot to say about TV production in the 1980s. I want to get it online in the next month or so, but as our discussion lasted for almost two hours, it might take a while to write up.